NOTE: I will be out of the country between April 5th till April 21st so I will not be selling guitars during this time! Below are a few guitars that I have for sale. You will see I also sell custom built guitars that are "One-Off" with Custom Shop quality at a lot less $$. Some samples are seen in my SOLD SECTION and on my page dealing with my Custom Built Guitars. You will sometimes see an (ON HOLD) on a guitar. These means a person of interest has send a down payment and will be purchasing the guitar shortly. I can email you a complete description of condition on any guitar—every detail, what comes with it, and what type of case it has—just email me. OR you can click on the active links to my FaceBook account to see a lot of BIG pictures accompanied with a detailed description. You do not need a Facebook account to look at the pictures. CHECK BACK FROM TIME TO TIME AS I HAVE A LOT MORE THAT WILL BE LISTED SOON - maybe even some old Gibsons! NOTE, I do this as a hobby so I am not going to be a "salesman" trying to clinch a deal with you! ;-) I really don't care if I sell anything, so no pressure - no nonsense. Almost all of my used guitars are taken apart, cleaned, inspected, re-assembled, and then carefully adjusted to play properly. Why take a chance at getting something not represented honestly off eBay or Reverb? And people are asking ridiculous prices for junky guitars with big chips and dings! That will not happen with me. If you are interested in any of these, just shoot me an email and we can discuss a possible sale. I am also open to offers. Also shipping is not included in the sale price. 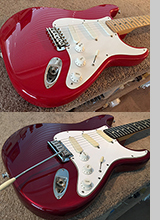 How I rate the condition of my guitars (A MUST READ! ): First off, don't you just love it when you see an older guitar advertised as: "In MINT Condition!" Then they go on to list all the fret board peeling, dings and dents the guitar has! Then they say something like, "Of course, none of this affects the playability of the guitar!" To me "mint" means untouched and uncirculated—like not gigged or played hardly at all. But after stating that, The Blue Book of guitars is a bit less picky and says this about collectible guitars: "98% - Mint, 9.8 - Only very slightly used and/or played very little - may have minor "case" wear or very light dings on exterior finish only, without finish cracking, very close to new condition, also refers to a currently manufactured instrument that has previously sold at retail, even though it might be unplayed." I perfer to say, New Old Stock would be mint but according to the Blue Book of Guitars, most of my guitars would be MINT! LOL!!! I have rarely seen a "use" guitar that was truly in mint/unplayed condition! The point is, I am too OCD to say that about a guitar, unless it is true. If I say a guitar is "near mint" that will mean it is as nice as most new guitars you would see hanging in a music store. Also, in my fanatical way of doing things I might add a + or a - to a condition. Like "Excellent -" better than "very good" condition but not quite "Excellent"! MINT CONDITION: Like New Old Stock - basically unplayed condition. NEAR MINT: Is rated around a 9.8 or higher out of a 10, meaning it is like brand new but has a some very, very light play wear, usually some very light impression(s), or a small nick, etc. EXCELLENT: Is rated around a 9.5 or higher out of a 10. It might have a one or two micro-blemishes, WHAT MOST PEOPLE CALL MINT. VERY GOOD: Is rated around a 8.5 or higher out of a 10. It might have a few very light bumps or dings but will have a high gloss, every part cleaned, and everything functioning as it should. GOOD: Is rated around 8.0 or higher out of a 10. Rarely will you see me sell a guitar in this condition. My OCD ways just can't do it... ;-). Take time to look at: Some of the Guitars that have SOLD! Also read a few of my: BUYER REVIEWS! I have two "selling" sections for your consideration. NOTE: I will be out of the country between April 5th till April 21st so I will not be selling guitars during this time! I will have some rare and interesting ones coming then! 2018 XHEFRI CUSTOM FLAMED STRATOCASTER : Condition: BRAND NEW!! Click on my FACEBOOK Page link to see a lot of BIG HD pictures including under the hood and the build process! This is another XHEFRI Custom Strat. 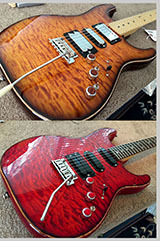 Scroll down and read som of my review from people who have bought these custom boutique guitars. On this one, I started off with a highly flamed quilted maple top on really nicely striped mahogany body. The body also has a contoured neck joint to make it easier to play the higher registry. This has a Seymour Duncan 59 PAF humbucker in the neck, standard Chrome Dome in the middle, and a Hot Chrome Dome Dually in the bridge. The 59 is such a sweet pickup—which replicates the old 1959 old Seth Lover Les Paul tone, but unlike the original 59s this one has 4-conductor lead which allows for cutting off one side of the coils using the first mini-switch. When split, this gives the guitar more of a "single coil" tone in the neck like a traditional Strat, and works well when mixing with the other pickups. When both coils are on, it is more like a Les Paul! I used a 500k no-load pot, with a "Brownie" .018 cap for the humbucker in the neck. This will allow use of the tone control with out making the pickup ugly-dark, too soon.This also has a brand-new Fender deluxe bridge with pop-in trem bar and chrome saddles. Take time to look at Some of the Guitars that have SOLD! I decided to purchase my first guitar from Xhefri's Guitars. My Strat arrived in packaging well suited for its journey. When I first opened the case I had to take a moment before I could actually touch it. Beautiful in pictures on the site, but in person - wow! While my Strat was in transit Xhefri gave me updates and background info on the guitar's history and also shared personal stories about his hobby and our mutual interest. That was an unexpected bonus that really personalized my purchase experience. I hope to someday be lucky enough to snag a quilt top Ultra. Xhefri gave a little help too by included a funny little bonus with my guitar that I plan to wear often. I'm not sure if I decided to by a guitar because of the hours spent on xhefriguitars.com, but I know when I hold this wonder piece of wood and feel and hear the sound I’m happy and inspired to practice. Many, many, thanks Jeff. Tery, New Braunfels, Texas. I just want to let people know Jeff is not telling the truth about his guitars! 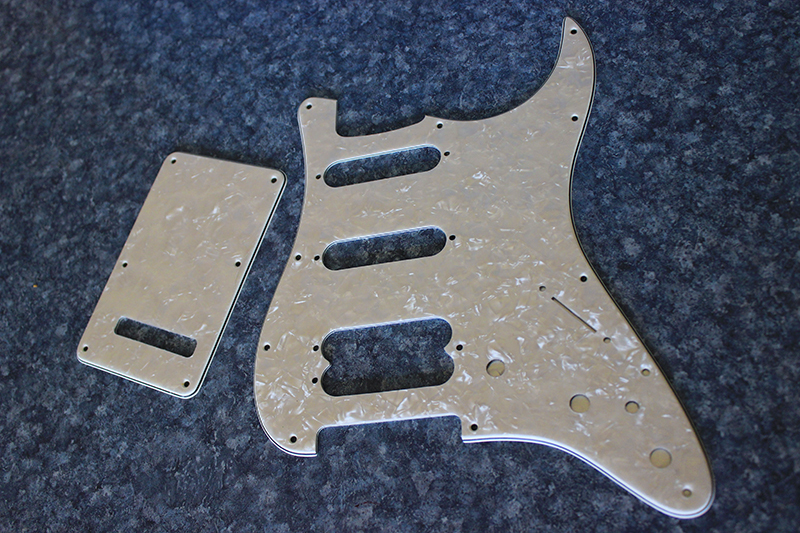 I have received 8 Strats, 1 Teles and 1 custom build… they were not how he described them! They were 10 times better!!!! Beautiful action, mint condition, and with a bit of luck and God willing, I will get 8 more from this gentleman! – Des from Kiama, Australia. Hi, I picked up the guitar yesterday at German customs and have been playing almost the whole rest of the day! Really, really nice instrument, beats the other Ultra I own. Thanks a lot!—Michael from Germany. Hey Jeff! I wanted to let you know that I received the instrument and it is in incredible condition. I wanted to thank you so much for this guitar, I fell in love with it instantly and I am so grateful for all the care you put into packaging—never seen that much care even from amazon or eBay. I hope to do business with you again soon. - Stephan in Quebec, Canada. This transaction with Jeff couldn't have gone any smoother. Firstly, he agreed to sell a quite rare and pristine Strat Plus to me that he probably would rather have kept. But the guitar had sentimental value to me and Jeff appreciated that. I offered a healthy price for it, but he countered with a LOWER amount, insisting that the guitar, while very nice, was worth less than my offer - now that's some integrity! He packed it well and shipped it quickly, going out of his way to ensure that the package spent minimum time on the UPS truck amid fluctuating temperatures. When the guitar arrived, it was in even better condition than I expected and it was setup perfectly. Don't ever buy a used guitar, especially a Strat Plus, from anyone else. Jeff is not only the preeminent authority on those guitars; he's also a very fair dude. - Anthony in San Diego, California. Jeff... I got the guitar... what a beautiful guitar... It plays really nice and sounds awesome... I cant seem to stop playing it... Or looking at it!!!! There is so much cool going on with it... The body, the neck, the pickups, you did a great job of picking the components and an awesome job putting it together... Great job on the wiring too (I took a sneak peek)... Its dark sounding but bright too... And articulate... Hard to explain... But clean with a little chorus and a tidge of delay it is beautiful sounding... And it sounds great with gain too... Its just a cool guitar... ;-) — Pete, a return buyer in Albuquerque, New Mexico. Wow!! That's all I can say Jeff. Arrived late last night, had a quick look at the guitar and this morning, tuned it, played it, and I'm chuffed as mint balls. You described it as it is, the best Fiesta red I've seen. Thanks again, keep in touch. Kind regards. — Tony, United Kingdom. I got my deluxe custom Strat Plus with the humbucker and an extra switch for a lot of combination of tones, and its a dream! So many sounds, variation that are ez to switch. Far more versatile than the Les Paul. Dealing wit Jeff was great. So ez. Custom packing and case. It all worked out great with my travels in/out of the country. The guitar made it to Florida then to Dubai; then on to Saudi. Perfect! It will next take a journey to Thailand! What to get next !! — Ed who works in various places world-wide. I bought ”Jennifer” (is what I named her) from Jeff (xhefri). She looks gorgeous and plays beautifully. ”Jennifer” is a solid piece of work and a great axe that suits me both as a touring and a recording musician. I visit Jeff´s website once a month to check what he´s working on, and also to see if there´s something for me. — Ketil Stokkan, Norway (www.ketilstokkan.no). I just wanted to let you know that I received the Strat, no signs of abuse from the post office…It’s beautiful, I love it! Feels good, sounds great, perfect. Thank you very much Jeff, it was a pleasure dealing with you and everything was as you said it would be; I don’t want to be too negative but that’s very unusual these days!! Oh, and thanks for t-shirt! … I look forward to doing this again! — Brian, Canada. I have purchased a lot of guitars from Jeff over time and wouldn't consider dealing with anyone else. The descriptions are accurate and the guitars top notch. I am a fanatic with my guitars and always thought I was a bit OCD but Jeff matches me for his love of his guitars as well. I often wonder how he can sell the ones he does as they are so nice. Deal with confidence as the guitars are actually better than Jeff describes. — Bob, Australia. Jeff was great to work with. Very knowledgeable, friendly and honest. Guitar was exactly as he and the pictures described. I'll be buying another from him! — Pete from Albuquerque, New Mexico. The guitar arrived just fine - nice packing. Also looks exactly as described, and I played it this morning and it sounds great. You are right about the color -- that blue you see in the photographs really looks different under light -- green happens to be my favorite color so it is a nice surprise. Thanks - maybe we can do some more business later. — Dale in North Carolina. 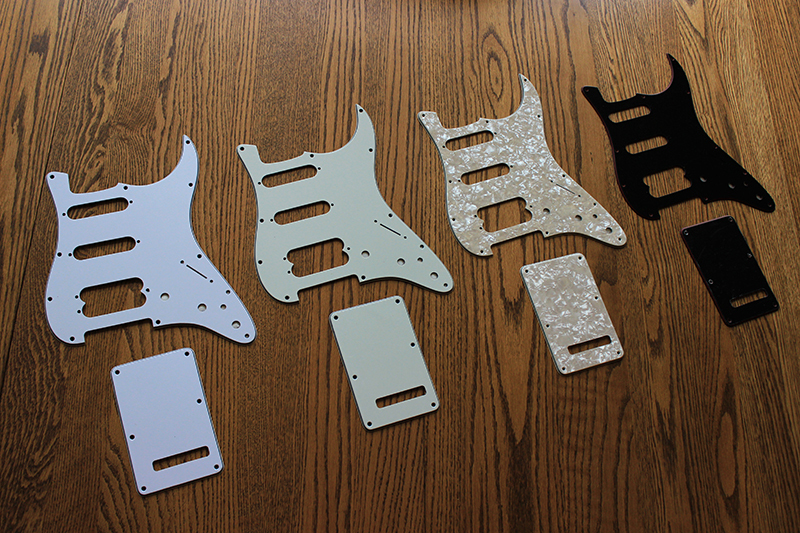 The '89 Strat Plus Dlx v1 (Silver/Silver/Blue) arrived in great shape, just as Jeff had described it. Jeff went to great length to describe two tiny dings on the guitar, which I never would have noticed in the first place. The guitar was set up nicely (he adjusted it for me from 9's to 10's) and plays true. That's not to mention anything of the sound - it's unreal. The silvers provide a classic strat tone with a touch more mids (to my liking) and the blue bridge position gives that Gilmour type sustain - a great combination. I took it into Gryphon Strings in Palo Alto, CA - a well respected local shop - to deck the trem, and the guitar tech simply couldn't get over how well the guitar played. I have a new favorite guitar! If you are looking for a Strat plus, look no further - Jeff is your guy. — Jeffrey, Palo Alto, California. 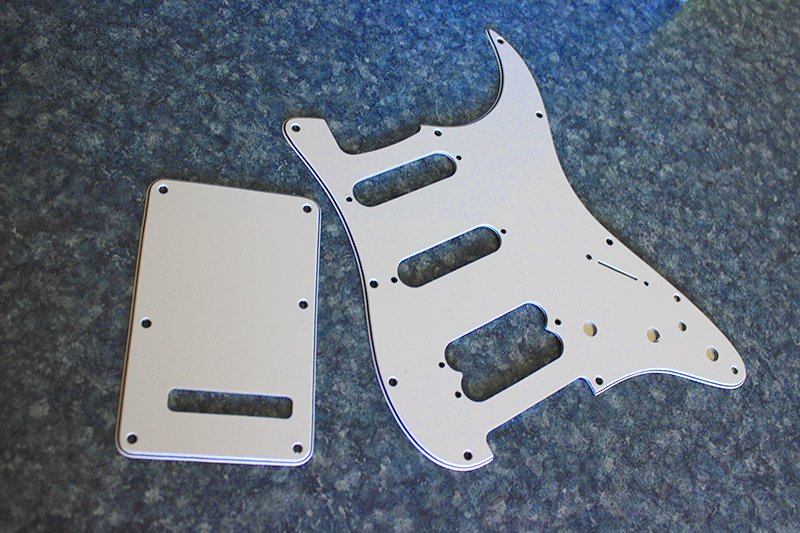 These Ultra pickguards are cut to the exact specifications of Fender’s Ultra and Custom Shop pickguards. 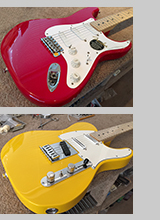 Fender use to offer these in White/Black/White and Vintage Pearl. I am offering, White/Black/White, Aged White Pearl, Parchment (off-white), and Black/Red/Black. See the above picture to get an idea of how the different color relate to each other. 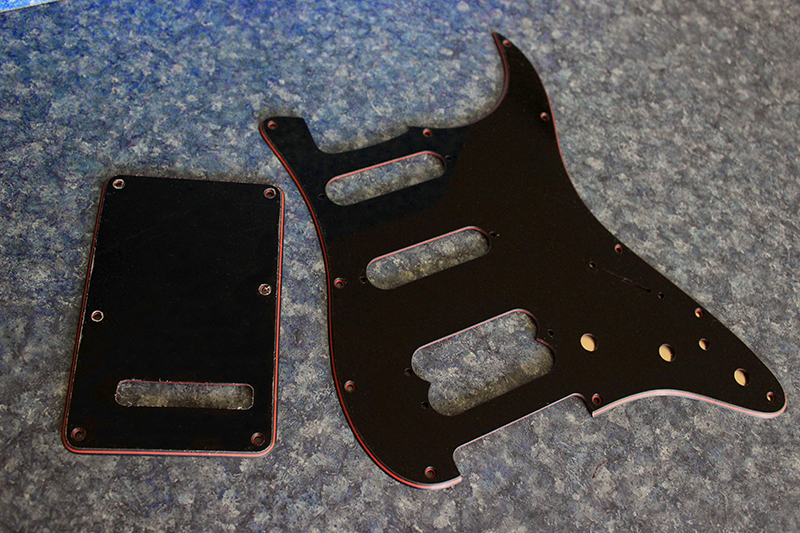 PLEASE NOTE, unlike other S/S/H pick guards, the Ultra pickguard is cut different and WILL NOT WORK on a Fender Strat with a standard S/S/H route. The reason is: 1) the middle pickup on an Ultra is centered perfectly between the bridge and the neck pickups, whereas a Standard S/S/H pick guard has the middle pickup closer toward the bridge pickup. 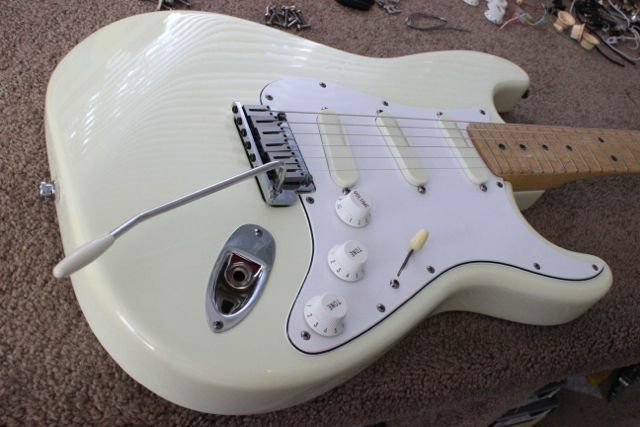 All American Standard, Strat Plus, and Ultra guitars of the 1980s-1990s had swimming pool routes, 2) The bridge route is designed for the Lace Sensor Dually pickup using a 3-hole mount, & 3) there is a mini-switch hole drilled beside the two tone control knobs. 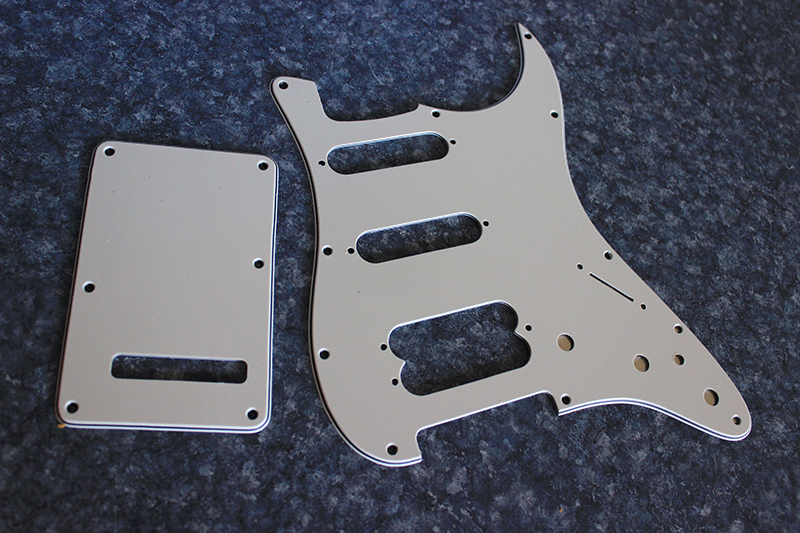 Again these are cut to fender factory specifications.